It doesn't get more Disney than Mickey and Minnie Mouse and this sterling silver Minnie Mouse pendant makes the perfect gift for any Disney fan. 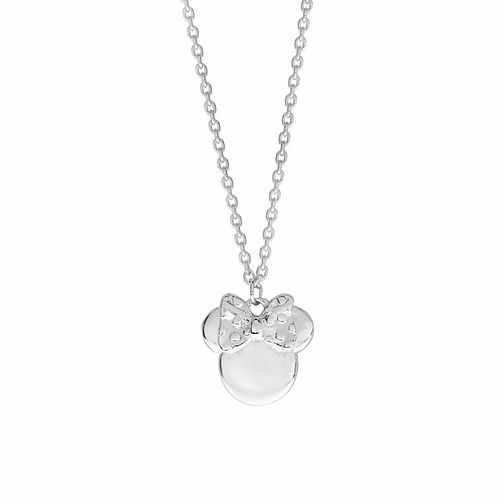 This pendant is decorated with the iconic polka dot Minnie Mouse bow on the world famous mouse ears. Set on a 14 inch chain with a 2 inch extending chain, this gorgeous piece of jewellery is perfect for children, teens and young adults alike. This design is exclusive to H.Samuel and each piece comes with its own beautiful Mickey and Minnie gift box. Disney Children's Minnie Mouse Sterling Silver Pendant is rated 4.0 out of 5 by 4. Rated 3 out of 5 by Anonymous from Nice necklace, awful gift box This childs necklace was ordered as a Christening gift, so I paid extra for gift wrapping. The necklace was lovely but the 'gift wrapping' was a cerise pink and black flock patterned box, which was totally unsuitable for a child's gift, four times to big for the gift and damaged.